32 m.ü.NHN. – 114,7 m.ü.NHN. (II) explores the way we survey landscapes and the natural world. As in earlier works, his backdrop is the history of European conquest: the efforts of European countries to colonise foreign parts by force have always been closely associated with strategies and techniques for measuring land. In 32 m.ü.NHN. – 114,7 m.ü.NHN. (II) Cyrill Lachauer draws on a visual medium with strong political connotations: coloured smoke, as used in pyrotechnics and – often reflected in so many media images – by protesters, football fans and guardians of the law to defend themselves, to attack and to stir up an atmosphere. With smoke as the “protagonist”, the super 16 mm positive film implements the notion of surveying a specific territory: the city of Berlin. Lachauer ignited cartridges of smoke ranging in colour from orange via capri blue to pale grey at five different spots around the metropolitan region, all of them at different altitudes. Orange smoke, in terms of the geographical map, represents the lowest point, the lakes along the River Havel, while pale grey marks the city’s highpoint, the Grosser Müggelberg. 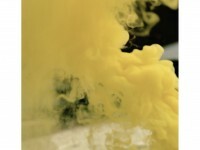 Although each colour is ascribed to definite points in the urban topography, the specific places marked by the smoke play a subordinate role in the film. 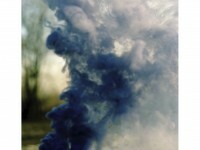 The places where the smoke forms clouds before eventually dissolving can be interpreted as coordinates. These indicate the physical points where Lachauer performs his measurements. Besides, in their abstract form and expressed as altitudes, they link the subjective choice of colours to a scientific designation (m.ü.NHN – metres above mean sea level). The real places are only visible when a piece of sky or the glint of water is glimpsed between the billows of smoke. Immanuel Hick’s camera, fixed to its tripod, focuses entirely on documenting the smoke formations. The performative acts – i.e. the ignition of smoke cartridges for surveying purposes – are not included in the film. Lachauer’s editing is also minimalistic. As a result, the narrative, performative aspects yield to an experimental character. By dispensing with any narrative, the film concentrates on its essential features: image and sound. What is unusual is that the sound track begins before the first pictures appear on the screen. The images in the mind’s eye of the viewer thus exist side by side with the real pictures subsequently added. This is not merely a clever atmospheric stratagem, but an interesting reference to the concept of “smoke”, which manifests as an unstable gas visible for a few minutes before vanishing into thin air. The vehemence of the music as it fills and takes possession of the room does more than highlight the autonomy of the sound, which is maintained throughout the film as a distinct layer of interpretation. The sound track also harmonises intriguingly with the visual depiction when the “smoke” theme is characterised by the music as both aggressive and mystical. This dovetailing of sound and imagery, which are two separate components, is a vital fruit of the cooperation between Ari Benjamin Meyers and Cyrill Lachauer. Meyers, who composed and recorded the music for 32 m.ü.NHN. – 114,7 m.ü.NHN. (II), provides the film with an acoustic layer which performs a particular service: it pre-empts any risk that the apparently endless sequence of thickening smoke might be perceived merely as a pretty play of abstract colours. Even before the first minute passes, the smoke has ceased to have anything in common with established imagery from art history – abstract, open and associative. Lachauer’s abstract smoke patterns verge on the aggressive, not just marking a place, but dominating it until nothing remains of its original form. The artificiality of the smoke and its dominance are further traits which embed Lachauer’s film within a series of works where the artist has addressed the act of measurement and its significance. 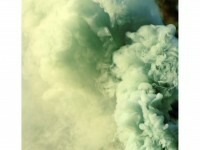 In his film documentation of the climbing performance Fleischbank / Meter über Meer [Fleischbank / Metres above Sea Level] in 2010, the artist indicated regular contours with colourful smoke signals as he surveyed the mountain vertically. Transposing altitudes into a colour scheme is also the principle underlying the abstract piece Matterhorn (2010), where Lachauer defined the height of one of the world’s best-known mountains through seven colour-highlighted points denoting altitude and energy. Cyrill Lachauer not only translates the “land measurement” topos into a synaesthetic experience, reducing the rational scientific aspect of surveying strategies and their cartographic expression. He is also indirectly tracing what land measurement means in physical terms: appropriating space and converting it into data. The space becomes a construct, making it containable and temporarily controllable. The film was produced with the support of Sammlung Goetz, Munich.